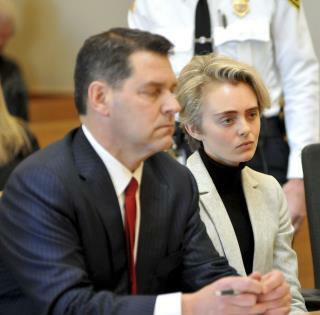 (Newser) – A Massachusetts woman who sent her suicidal boyfriend a barrage of text messages urging him to kill himself was jailed Monday on an involuntary manslaughter conviction nearly five years after he died in a truck filled with toxic gas, the AP reports. Michelle Carter was sentenced to 15 months in jail in 2017 for her role in the death of Conrad Roy III, but the judge allowed her to remain free while she appealed in state court. Massachusetts' highest court upheld her conviction last week, saying her actions caused Roy's death. A lawyer for Carter had argued the 22-year-old should stay out of jail while her defense team takes her case to the US Supreme Court. Her attorneys said in court documents that she has no prior criminal record, hasn't tried to flee, and has been receiving mental health treatment. But a judge ruled Monday that she should start her sentence. Such wasted talent. If she could sell to someone the idea to off them self, she can sell anything. Her being charged is like blaming a song or a movie for why someone killed themselves. There is a mental issue here with the individual, stop looking for scapegoats because someone has issues.